Dubai, UAE, October 18, 2017: In continuation of the World Tourism Day celebration, Sharjah Commerce and Tourism Development Authority (SCTDA) has initiated a program under the Industry Professional Training Department (IPTD) of Marhabtain Training Program called, “My Destination – University Student Orientation Program.” SCTDA Senior Consultant for Tourism Affairs, Mr. Mohamed Youssef along with his team has conducted the orientation on October 9, 2017, at SUC campus to briefly introduce “My Destination” to students followed by an arranged tour. SUC Dean Dr. Amitabh Upadhya, Deputy Director and Head of Marketing and Creative Communication Mr. Rakesh Gaur, and Head of Student Services Dr. Osama Ali Thawabeh welcomed the SCTDA team while Associate Professor Dr. Mohit Vij accompanied the students during the duration of the tour. This program aims to familiarize the students with the destinations in Sharjah and to promote the emirates through word of mouth and online. The program is mainly targeted to university students from various universities in Sharjah. 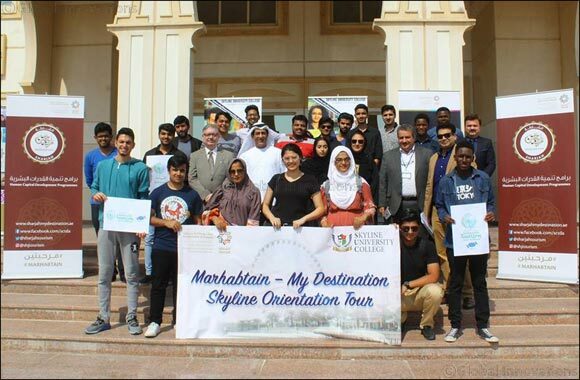 Skyline University College is the first university to benefit from the program where students had the opportunity to visit some of Sharjah's destinations like Sharjah Planetarium and Mleiha Archeological Center along with SCTDA Professional Tour Guide and team. SUC is grateful for having been part of this program and will continue to support SCTDA’s endeavor to promote Sharjah as a tourist destination.